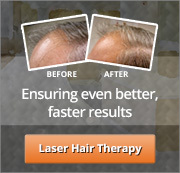 Hair loss is one of those things that can be stopped and reversed if you start working on it right away. The longer you take to visit area Boston hair loss clinics to discuss hair loss treatments for men, the harder it will be to recover. It is possible to regrow hair in the Greater Boston area, but you need to visit South Coast Hair Options in New Bedford to find the treatment that is right for you. Avoid treatments that promise a one-size-fits-all solution for every type of hair loss and condition. Someone who is experiencing hair loss due to stress or a medical condition will require much different treatment than someone who has the signs of male pattern baldness. When you visit our clinic, you will notice a difference right away in the way that we work to find a solution for your unique situation. We start each new relationship with our clients by offering a FREE hair and scalp analysis. This helps us to identify the underlying cause of your hair loss and find the best solution based on your individual needs. While some of our clients may respond better to low-level laser therapy (LLLT) treatments, others may require something completely different. Our Corrective Hair Solutions (CHS) approach is designed to address your unique needs to ensure the fastest and most comprehensive results. If you have ever heard rave reviews from friends who swear about the value of a shampoo solution for hair loss but saw no improvement for yourself, South Coast Hair Options is for you. We can help you regrow hair in the Greater Boston area and find solutions that are best suited to your condition, lifestyle, and budget. Stop wasting valuable time and quit flushing money down the drain by relying on over-the-counter solutions as hair loss treatments for men. While they may work for some individuals, they are not designed to work for every type of hair loss. It’s time to get serious and find a treatment that is right for you. There are many different indications that could point to hereditary male pattern baldness, so it is essential to seek professional advice from reputable Greater Boston hair loss clinics like South Coast Hair Options. Reading a few tips online or browsing an article in a magazine won’t provide you with a definitive diagnosis or help you get the best solution for your needs. However, if you notice any of the following signs of male pattern baldness, make sure to get to our clinic right away for evaluation so you can start to regrow hair in the Greater Boston area right away. An “M-Shape” Hairline – Keep an eye out for a hairline that begins to work itself into an M-shape or even a horseshoe U-shape at the forehead. This is one of the typical signs of male pattern baldness, which can be effectively treated at South Coast Hair Options with our Corrective Hair Solutions approach. 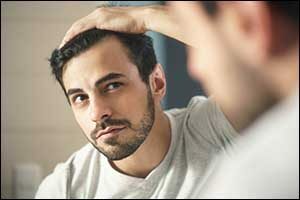 Thinning Hair All Over – Look all over your scalp to identify areas that may be thinning. Some common areas include the crown of the head, the temples, and of course, at the hairline. If you notice any areas that appear to be thinner than the rest of your scalp, contact our Boston hair loss clinics right away for the best results. A New Widow’s Peak – While some people are born with a widow’s peak, which can be an identifying and trademark feature, others do not get one until later in life. If you never had a widow’s peak before, but are noticing that one is appearing, this could be one of the signs of male pattern baldness. Male pattern baldness can occur at any age. We have had clients in our clinic that were under the age of 20, and we have seen individuals who did not experience hair loss until they were much older. Keeping an eye out for the signs of male pattern baldness can help you stay on top of the issue, which can increase in possibility as you approach your fifties. Studies show that more than 50 percent of the American population will experience some type of hair loss by the time that they are 50 years of age. Learning what to watch for will give you the best opportunity to regrow hair in the Greater Boston area before the hair loss becomes too great. While there are many famous men who have decided to embrace their baldness, not everyone has to throw in the towel. You can do something about it right now by visiting our Greater Boston hair loss clinics in Southeastern Massachusetts. Step up to the plate and do everything you can to ensure that you keep a full head of hair as long as you can. Give us a call at 508-995-7085 or stop by our location on Acushnet Avenue in New Bedford, MA.